SF Greek Historical Society taking part in SF History Expo this weekend! Stockton Greek-Americans will have a chance this weekend to see their own Jim Lucas in action as the president of the SF Greek Historical Society. The group will be part of the 4th Annual SF History Expo ("Piecing Together Our Past") to be held March 1rst (11am - 5pm) and 2nd (11am-4pm) at The Old Mint, 88 Fifth Street at Mission. Tickets cost only $5, children under 12 get in FREE...The Bay Area Greeks will be one of more than 50 SF organizations creating "mini-museums" showcasing their histories. In addition, there will be historic films, special programs, an art exhibition, and more. Really wish I could be there...Go, Greeks! St. Sophia Greek Festival opens in Miami -- OPA! Just sitting here waiting for the 2nd cooking class in "Yiayia's Kitchen" at the St. Sophia 36th Annual Greek Festival, "Experience a Greek Odyssey!" 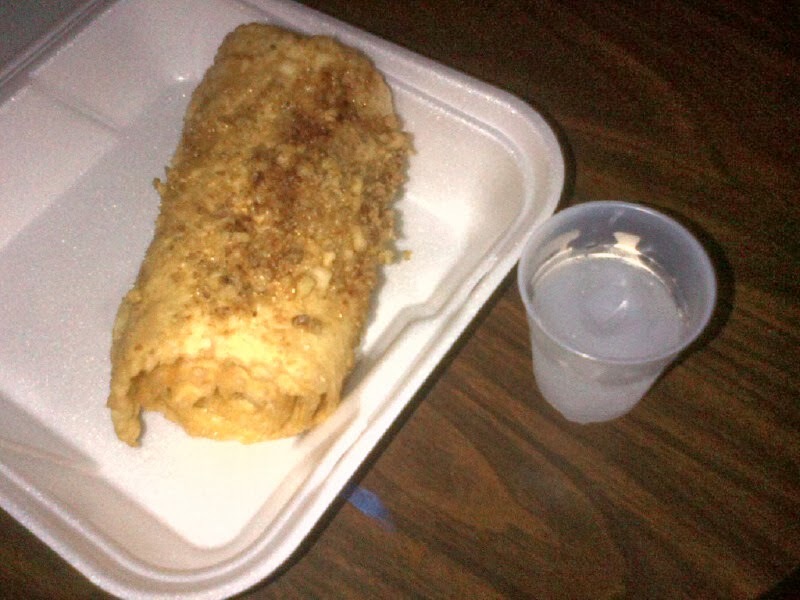 The kids are dancing up a storm, while I eat my dinner: Ouzo with a rather large dipla (thinly rolled fried dough, drizzled with honey and sprinkled with nuts and cinnamon). 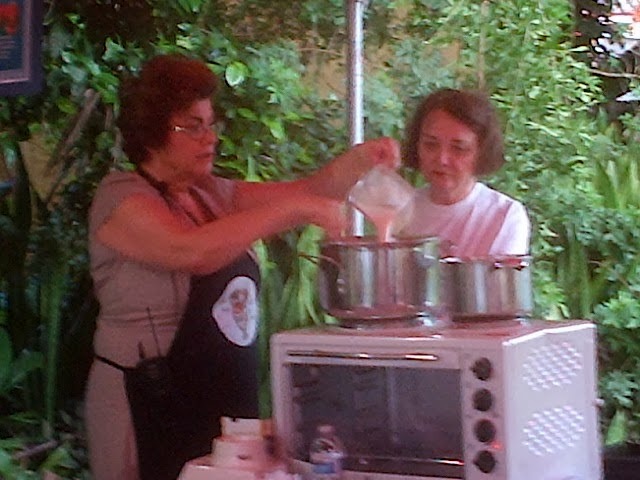 That was my favorite Greek sweet made by my Yiayia Sarris, along with melomacarona. However, I always asked for well-cooked, naked ones (NO syrup, etc.) She never quite understood my addiction to crispy, crunchy, and burnt whatevers -- but she cheerfully complied, even sending me some melomacarona in a shoe box when I spent a semester at Drew University in New Jersey! I did preface that strange meal with samples of avgholemono (egg-lemon) soup, spinach pie and baklava at the wonderful 5 o'clock cooking class. Three women (one with her 2 sisters!) showed us the ropes, plus a few secrets. Notice the great portable stove they used...Did you know that you sprinkle some water on both the scored spinach pie and baklava before baking so the filo edges won't curl? And don't forget to cover your unused filo as you work with a damp kitchen towel so it won't dry up and tear! Next class features "village pita" -- with surprisingly flaky home-made crusts like my Yiayia Xanttopulos from Naoussa used to make...So much to learn, cook, and eat a la Greque -- OPA! Proud of Greek-Americans helping Greece! I was very proud to read "Greek Orthodox Americans Rally Support for Their Troubled Homeland," an ON RELIGION column published in the New York Times last month. It talked about Greek-Americans helping Greece through hellish economic times...Indeed, the Greek Orthodox Archdiocese of America has sent $4 million in people-to-people aid since 2009 through its own/related charities and local churches. The article described a fund-raiser held on Martin Luther King, Jr. Day (a day of service) by 5 Philoptochos chapters in Brooklyn and Staten Island. The goal was to raise $30,000 for children's shelters in Greece. Members from Holy Cross Church in Bayridge, Brooklyn, have made 4 relief trips delivering thousands of dollars and tons of clothing..."and witnessing a societal calamity none of them had expected in this century." The volunteers have paid their own way and hand-delivered their contributions directly. Disposable income in Greece has plummeted by 40% and unemployment is now nearly at 30%. "Among children, the level of 'food insecurity,' meaning hunger or the imminent risk of it, tops 50% in the poorest sections of the nation." Few people can afford to use oil to heat their homes and chop/use wood for that purpose. "The crisis is not as immediate as an invasion," Dr. Alexandros Kyrou, a historian at Salem State University, said. "It has been slow in gaining momentum, but it has now reached a crushing level. But it is no less a humanitarian crisis than the ones in the past, and it needs the kind of humanitarian response Greek-Americans have provided in the past." Some have resisted helping, believing that Greece brought this modern-day tragedy on itself....But how can we blame children who go to school hungry or seniors without health insurance who cannot afford to buy their medications (our own relatives included!) for decisions made by political leaders and self-serving governments?